Fortin Electronic Systems is born from a real desire to build products and solutions that will help vehicle aftermarket electronic installers to perform easier and faster installations. Over the last decade, our dedication to innovation combined with our strong expertise in multi-level car integration drove us to deliver the most reliable and cost-effective interface and remote starter platforms on the market. Today, with the evolution of connected vehicles a new era is on the horizon and our team embraces the challenge of setting the bar in fast installations. Fortin Electronics Systems was created in 2004 as a division of Fortin Auto Radio, a renowned Montreal company specialized in car audio and electronic device distribution. As the inventor of the first CAN module Fortin took the lead of the interface module industry. In 2009 the EVO-CHR series was launched. It was the first Preloaded Bypass Module on the market. A new revolution in cabling technologies has also been deployed by Fortin and was called the T-HARNESS. 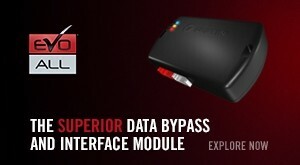 In 2010 the EVO-ALL Preloaded All-in-one Bypass module was released and took over the market. The EVO-ALL is now a fully-loaded interface module the supports standalone functions. 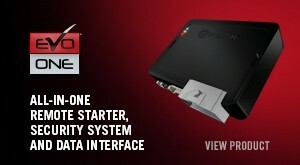 In 2014 Fortin launched the EVO-ONE, the all-in-one module that combines an interface module and a remote starter and that exceeds every standard in compatibility. 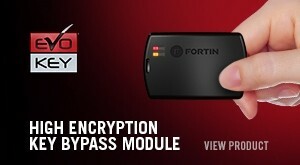 In 2015 Fortin launched the EVO-KEY, the high encryption key bypass module that works with DCryptor Technology. Fortin Electronic Systems offers a complete and integrated private labeling service. We offer white-label products, an exclusive lines of solutions and marketing programs. We invite you to contact us to learn more about our Private Labeling Programs. Fortin Innovation Labs is a consulting unit that is devoted to the development of custom in-vehicle technology and its integration. We specialize in consulting and analysis, R&D, troubleshooting and custom product manufacturing. We invite you to contact us to learn more about collaboration opportunities. Discover our corporate news, press releases and medias publications. Are you a registered user? Sign up for our newsletter to be the first to receive news about our latest products and firmware updates.